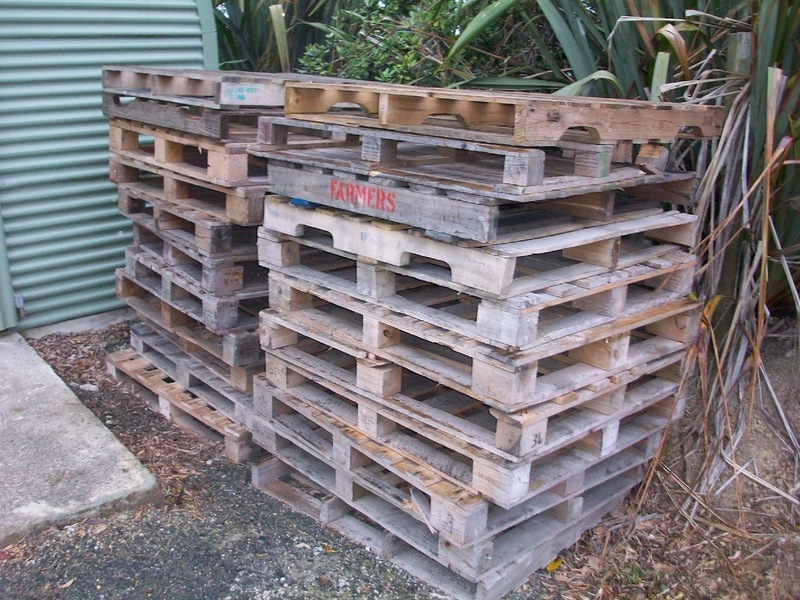 aahh, the joy of having a pile of pallets to use on ... well ... anything! we are totally getting into pallet wood creations in this neck of the woods. steve and i have been thinking up all sorts of ideas and projects to make with this collection of pallets we were given by some awesome friends ... part of the deal with getting these pallets was returning some of them in the form of cape cod chairs, we will get to that i promise sue! so many friends and family wanting steve to get busy and make some more ... hint, hint honey! but for today we are into making some art for ben's bedroom wall with the pallets. 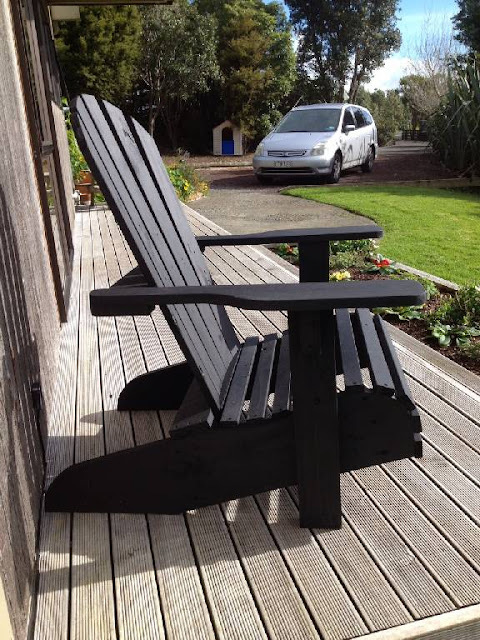 all you need for this project are the top slats of the pallet. so your first job is to take them off as carefully as you can with a crowbar or similar. next you need a thin piece of mdf the size of the artwork you are making. this acts as the base of the project and will be what the pallet slats are glued to. 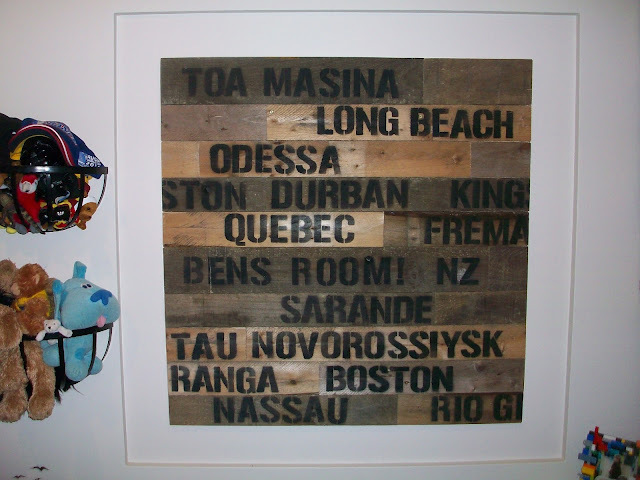 find a place to work and have your mdf laying flat then start laying the slats in rows along the mdf, making sure to fill the entire board with pallet wood. for interest make sure you have the pallet wood at all sorts of lengths so the joins aren't symmetrical. 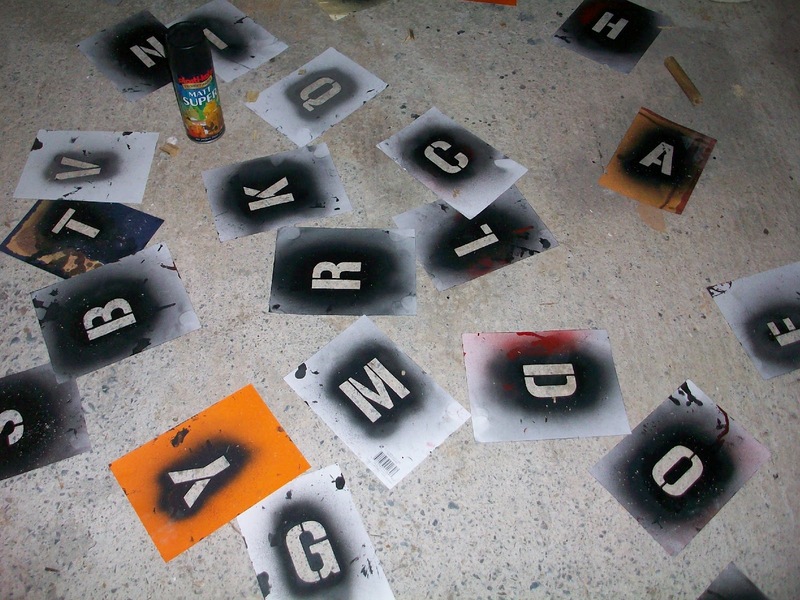 these stencils we made ourselves by choosing a font, printing them out on card and then using a craft knife to cut the letters out, leaving their silhouette. we have used them heaps and they continue to do a great job. 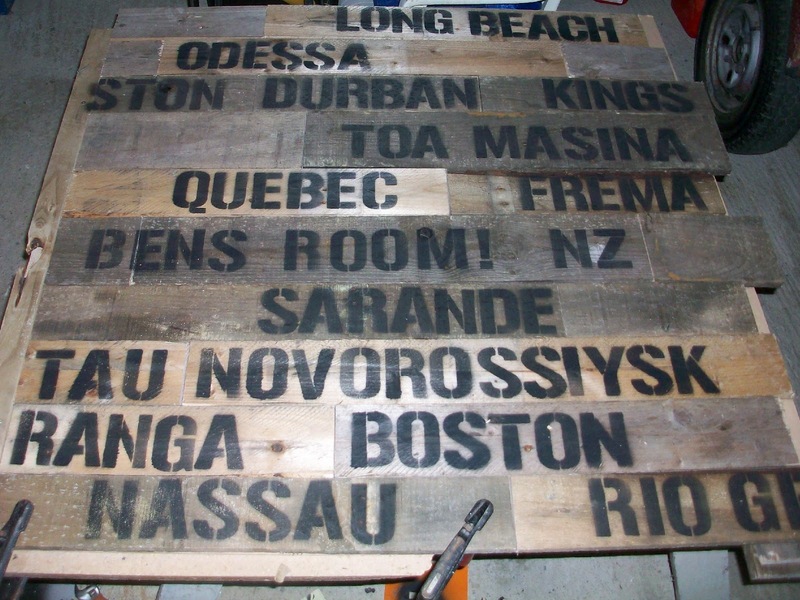 once you have the slats where you want them go at it with some stencils and spray paint and work your magic :) we decided to use ports around the world as ben's room has a bit of a travel thing going on and the pallet wood makes me think of big packing crates ready to ship off around the world ... remember the old tea chests, that's'a what i'm thinkin! spraying painting over, time to tackle the overhangs with a saw and fix it down to your baseboard. the edges have been sanded to add a nice finish to the piece ... best part is, ben loves it! It has been a long time since we exchanged a few words! How are you doing lately? Have you found a new home yet? I can tell that you are totally recovered from your surgery :-), aren't you? 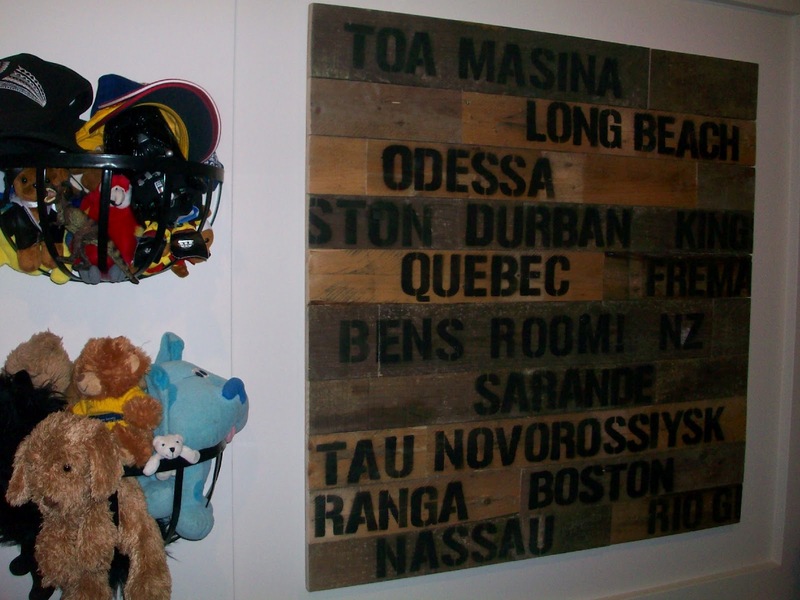 Your pallet creation is MAGNIFIQUE in Ben's bedroom. It adds a lot of character! I will get round to writing you an email soon...a bit fraught at the moment!! I really liked that you tried something new and it worked out for you and it looks great! Beautiful and very interesting your blog, congratulations. Kisses from Spain.